August’s stifling heat has some advantages – many plants have been lured by the sun into their full summer exuberance. 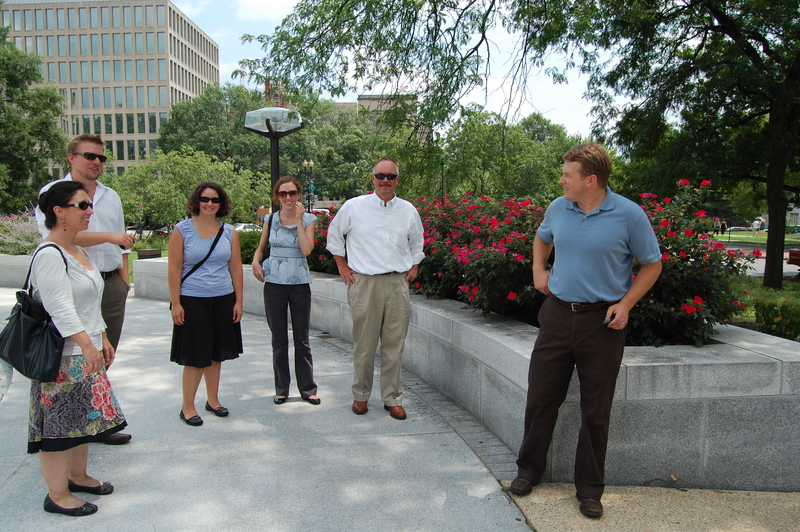 Oehme, van Sweden staff members spent a recent lunch break basking in the sun ourselves and enjoying lush plantings at the Federal Reserve campus in Washington, DC. The Federal Reserve was one of OvS’ earliest “big breaks” – our first large government project, designed and planted in the late 1970’s. Bold sweeps of perennials and grasses marked a striking departure from the formal style of the surrounding federal landscapes. Over the decades, Oehme, van Sweden has maintained a close relationship with the Federal Reserve and recently designed improvements for integrated perimeter site security (including custom bronze bollards, raised planters that incorporate benches and walls, pedestrian and vehicular access and circulation, and kiosk locations). During our lunchtime tour, OvS Principal Eric Groft pointed out ways in which the new design is integrated into the original and how the integrity of the original design (including now mature canopy trees, sweeps of ornamental grasses, and robust perennials) is honored. Eric was joined by OvS Associate Marisa Scalera (who has been involved in the Federal Reserve designs since 2003) and members of the OvS design staff including Christie Ciabotti, Lisa Cutshaw, John Knowlton, Nick Ries, and Liz Stetson. See our website for photos of our work at the Federal Reserve.